We source our piston seals through a world-wide network of certified suppliers. Our massive inventory, quality control and unparalleled customer service have made us a leader in fluid power, chemical processing, agricultural, food & beverage, plumbing and other markets. We can help you select the perfect seal for your application. Custom needs? We can help with engineering, prototyping, testing and industry certification. Our one-stop efficiencies also include JIT/Kanban programs, pre-production and kitting, special marking and packaging options and more. Five decades of perfect fits. You may be in a business with large manufacturing systems, but it can all come down to the quality of a little thing like a seal. In our business, seals are the biggest deal. We’ve built a five decade reputation for precision, reliability and service, and our dedicated Original Equipment Manufacturers have made All Seals an industry leader in fluid power, chemical processing, agricultural, food & beverage, plumbing and numerous other markets. We’re as demanding of our supplies as you are of yours. We source our products from around the world, and we’ve developed exceptionally strong relationships with a diverse supplier roster. We can help you with engineering, prototyping, testing and industry certification, no matter how challenging your project. Our one-stop efficiencies also include JIT/Kanban programs, pre-production and kitting, special marking and packaging options and more. For more information, quick quotations, expert consultation and responsive customer service call us at 800.553.5054. T-Seals are designed to retrofit O-Rings, either in static or for their intended use in reciprocating applications. Capped T-Seals are similar in function to that of a normal T-Seal, except the elastomer energizes a PTFE cap that seals the dynamic surface. Between the Capped T-Seals and the O-Ring loaded seal in terms of surface sealability. 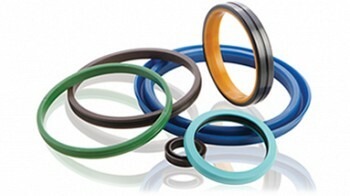 This low cost PTFE piston seal offers numerous different layout and material options for different applications. This is a single direction piston seal, meaning it can only seal if the pressure is from one direction. This dual action piston seal is designed for applications where maximum sealability is required. The asymmetrical unloaded U-Cup is designed to have both a static and a dynamic side. Grooved seals are bi-directional seals that are specially designed to deal with a wide range of sealing pressures. This Symmetrical U-Cup can be used as either a piston or rod seal and accommodates a small gland space.